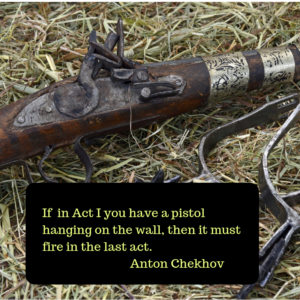 One of playwright Anton Chekhov’s most quoted maxims is this: If in Act I you have a pistol hanging on the wall, then it must fire in the last act. If you establish an expectation in the reader, particularly a strong expectation, you must fulfill it. The truth is that every story has things in it that must be fired, a multiplicity of tiny guns whose discharges help create the ending, guns that have been primed and loaded over the course of the story. 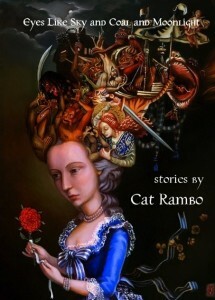 These are sometimes subplots: the heroine’s best friend is also looking for a love interest and at the end their expectation is either fulfilled or thwarted but it is never neglected, because the reader will exit the story wondering about that, and all the impact of the story will be thwarted. But not always. They may be an object that is reprised throughout the work: the lily that signals Death’s approach, the clerk who sold a traveler their tickets. Let’s look at some of this at work in a story that will be familiar to many, James Tiptree’s The Women Men Don’t See. If you are not familiar with the story, I advise reading it beforehand. This is the ending. My comments appear in parentheses. The cable said, Althea and I taking extraordinary opportunity for travel. Gone several years. Please take charge our affairs. Love, Ruth. I another another double, wishing to hell I’d gotten a good look at that gizmo. Did it have a label, Made by Betelgeusians? No matter how weird it was, how could a person be crazy enough to imagine–? With the third margarita I try a joke about alienated women, but my heart’s not in it. And I’m certain there won’t be any bother, any trouble at all. Two human women, one of them possibly pregnant (here a storyline with Captain Estéban is being resolved), have departed for, I guess, the stars; and the fabric of society will never show a ripple. 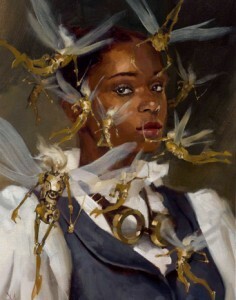 I brood: do all Mrs. Parsons’s friends hold themselves in readiness for any eventuality, including leaving Earth? And will Mrs. Parsons somehow one day contrive to send for Mrs. Priscilla Hays Smith, that grand person? I can only send for another cold one, musing on Althea. What suns will Estéban’s sloe-eyed offspring, if any, look upon? “Get in, Althea, we’re taking off for Orion.” “A-okay, Mother.” Is that some system of upbringing? We survive by ones and twos in the chinks of your world-machine…I’m used to aliens. (Here a conversation is being reprised, and its payload, set up earlier, is now being delivered.) She’d meant every word. Insane. How could a woman choose to live among unknown monsters, to say good-bye to her home, her world? As the margaritas take hold, the whole mad scenario melts down to the image of those two small shapes sitting side by side in the receding alien glare. 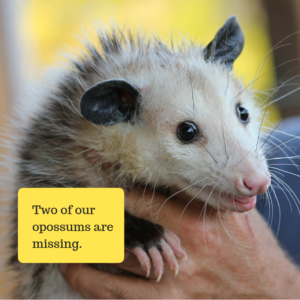 Two of our opossums are missing. “Sounds like a guerrilla operation.” I’m not really joking, here in the ‘gator den. In fact, I’m wondering if I spent too much thought on mahogany logs. How do we emulate that sort of thing as writers? I suspect this is something that most of us will be adding in the rewriting and revision stage, going back through the story to see what pistols our unconscious mind has scattered about throughout the narrative. 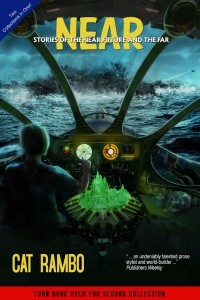 Recently, for example, in the course of writing a space opera novel, a particular element emerged that shapes things — while I took account of it in writing everything after that moment of realization, I’ll need to go back and tweak the earlier parts to make sure I’ve loaded that object as fully as I can before it delivers its payload in the final scene. Check what you’ve loaded the story with and make sure it’s all primed and ready to go off. Enjoy this and want more writing tips and musings on a weekly basis? Follow me on Patreon. 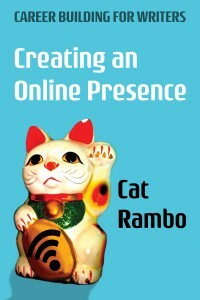 Or sign up for a live or on-demand class from The Rambo Academy for Wayward Writers! 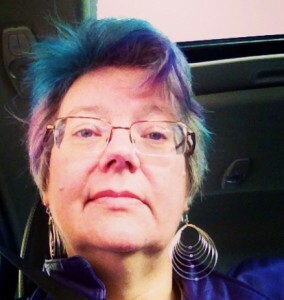 This entry was posted in Writing and tagged anton chekhov, chekhov's gun, james tiptree jr, plotting, the women men don't see, writing endings. Bookmark the permalink.